Mr. Fiumara has been practicing in the area of juvenile law for over 20 years. Mr. Fiumara is intimately familiar with not only the juvenile court system in Sonoma County, but the judges and many of the probation officers who end up making the decisions in your child’s case. Prior to the practice of law, Mr. Fiumara was employed by the City of Santa Rosa School District as a community outreach liaison and worked with school administrators and law enforcement. In the past, Mr. Fiumara has handled dozens of school expulsion cases which ultimately have a juvenile court component. 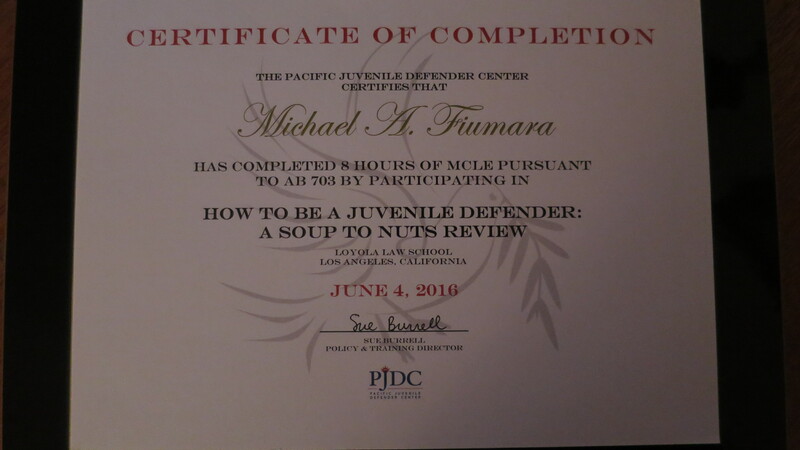 Therefore, Mr. Fiumara has that very well-integrated understanding of not only juvenile law, but how the schools, the courts, and probation officers play a role. Juvenile law is a completely different system than criminal law and criminal defense. A minor, unlike an adult, does not have the same Constitutional Rights as an adult. In juvenile law, there is no jury; only a judge. Mr. Fiumara knows both of the juvenile court judges in Sonoma County well since he has handled cases before both of them for many years. If your child or loved one has been arrested and is facing a juvenile court hearing, contact us – attorneys who will make sure that your child is not rushed through a juvenile court system and into a juvenile facility or even worse. What can a Santa Rosa Juvenile Law Attorney do for your child? An experienced juvenile law attorney knows the juvenile system and laws well. The attorneys at Fiumara & Milligan Law, PC will slow down the system so that there is adequate time to examine what is best for your child or loved one. We have a great deal of experience negotiating with judges and prosecutors to reach a resolution that is in the best interest of your child. We will make certain that the court knows and understands your child’s particular circumstances. This includes your child’s learning abilities and school environment, home environment, and any other peculiar circumstances that may have led to bad behavior or criminal activity. The ultimate question is: What led to the arrest? The answer/solution is: What is the best way to deal with this problem? Keeping rehabilitation, and not punishment, in mind, we examine and spend a great deal of time on which sentencing alternatives are not only available, but which are best tailored to meet your child’s needs without punishing your child. The juvenile court system’s main alternative is rehabilitation, not punishment. Again, what is the best, most effective way to resolve your child’s case? Please do not wait to get the legal help that you and your child need! We keep our fees low so that we can give everyone the experienced legal representation that they need and deserve. California’s adult criminal justice system is about punishment of offenders; however, the goal of California’s juvenile justice system has a different goal: treatment and rehabilitation of juvenile offenders. This firm is familiar with the broad array of methods and programs for addressing juvenile crime, which the prosecutors and the judges will be seeking. They take into account the severity of the offense and the background of the offender. The attorneys and the staff of this firm are intimately knowledgeable and familiar with the treatment programs, detention options, incarceration, and community supervision that is employed in providing escalating responses to offenses of increasing severity. These include probation, formal probation, detention, house arrest, and incarceration. Since it is our goal, along with the court’s goal, to rehabilitate the offender, we work with many agencies that have a key role to play in the juvenile justice system. This includes school districts, teachers, coaches, churches, social service agencies, and all of the community-based organizations who have worked well with this law firm over the years. This firm has a track record with working together with county probation departments for the best results. In California, county probation departments supervise over 97% of all juvenile offenders, while the remaining 3% are committed to the former Youth Authority now renamed Division of Juvenile Justice “DJJ” (an absolute last resort), thus becoming a State responsibility. County probation officers and their departments are crucial in that they make recommendations to the judges on the placement of your child and the sentencing of your child. Further, they supervise the juvenile offenders in the community and provide rehabilitation and training services to all probationers (juvenile offenders who have been sentenced). Finally, county probation departments operate the juvenile halls and county ranches, farms, and camps where your child may end up serving time. We are intimately familiar with these programs and the people who run them, and thus feel that we can help your child in their time of need. 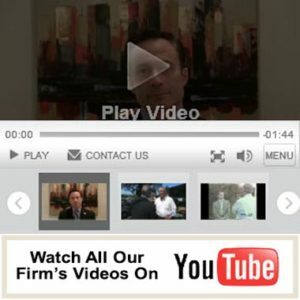 Attorney Michael A. Fiumara is experienced in working with a wide variety of treatment services for juvenile offenders and juveniles at risk who suffer from school failure, family dysfunction, substance abuse, mental disabilities, or a number of other factors that contribute to crime and bad behavior. Our attorneys can also be involved with your child’s other related problems pertaining to school expulsion, of which we have handled many cases successfully over the years, the entire informal probation arena, possible court involvement, formal probation, out-of-home placements, juvenile hall issues, and the county ranches, camps, and farms that are often set up as a last alternative to the Division of Juvenile Justice, “DJJ”. What to do if your child has been arrested? Retain an experienced juvenile attorney immediately. The truth of the matter is that anything your child says can and will be used against him or her in the juvenile court proceedings. In general, your child should NOT speak to the police. You should understand that the prosecution has to prove the elements of a crime beyond a reasonable doubt. When you allow your child to speak to the police, the prosecution is able to corroborate the allegations leading to criminal charges and a juvenile petition being filed against your child. Worse yet, police have been known to get innocent children to admit to crimes they did not commit. Based on this false evidence, prosecutors have been known to convict and incarcerate innocent juveniles. You should also know that oftentimes the interrogation rooms at the police station have hidden cameras and hidden tape recorders. Even if you are allowed to sit in during the interview, when there is difficulty getting the child to admit to a crime the police will often purposefully take a break to allow the parent and child in the room to remain there alone. Often their communications are secretly videotaped. This is a trick that has been used many times. When police do not want a parent present, the police will often go to the school where your child is attending to interrogate your child to prevent you from properly advising your child about his or her Constitutional Rights. Once your child is at the police station, the child is often interrogated a second time; this time by the assigned detective on the case. This stacked deck may persuade your child to confess to a crime he never committed! Detectives often tell the child they already have a lot of evidence against them and if they cooperate it will look favorably for them and that this would be written in the police report – don’t have your child fall for this! Juvenile offenders are also told by the police to write a written apology letter. Police often mislead juvenile defendants into believing this will help their case. This is not the case. Nothing is further from the truth. In fact, these so-called “apology letters” are generally never given to the victims, but rather used as “admissions” against the child to help get the child convicted of the alleged crime. Often these written statements are sent directly to the District Attorney’s office as part of the police report to show the District Attorney that the juvenile defendant has admitted the offense and should therefore be prosecuted for the alleged crime. What benefits are there to hire an experienced juvenile attorney prior to going to court? First and foremost, preparation is key to successfully defending your child. Getting a head start and defending your child gives your juvenile lawyer the opportunity to get a good grasp of your child’s social history, your child’s version of the facts, and time to gather witnesses and evidence helpful to your child’s defense. This can help map out a strategy for the initial detention hearing as well as future court dates to get your child released sooner rather than later. Fight to have your child acquitted of all charges at trial. 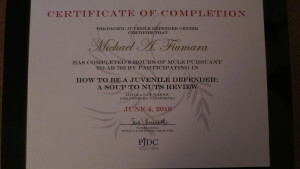 We are also a proud member of the Pacific Juvenile Defender Center. Please click on the logo below to be taken directly to their website for more info. Please contact us for a confidential and free consultation at our local telephone numbers 707-571-8600 in Santa Rosa and 415-492-4507 in San Rafael. Also please CLICK HERE to be taken to another excellent resource site for Juvenile Law matters.